A drug that reduces delirium in postoperative patients may work by preventing the overactivity of certain receptors in brain cells, according to a new study published in June 2018 in the Online First edition of Anesthesiology, the peer-reviewed medical journal of the American Society of Anesthesiologists (ASA). The researchers say the findings could lead to more widespread use of the drug, dexmedetomidine, and speed the development of new treatments for postoperative delirium with fewer side effects. A release from ASA explains that dexmedetomidine is used after surgery and in the intensive care unit (ICU) to reduce postoperative delirium, an acute condition that results in temporary confusion, disorientation, problems with memory, inability to pay attention, and sometimes hallucinations. Elderly patients are particularly susceptible to postoperative delirium. The problem affects up to 85 percent of elderly patients in the ICU. 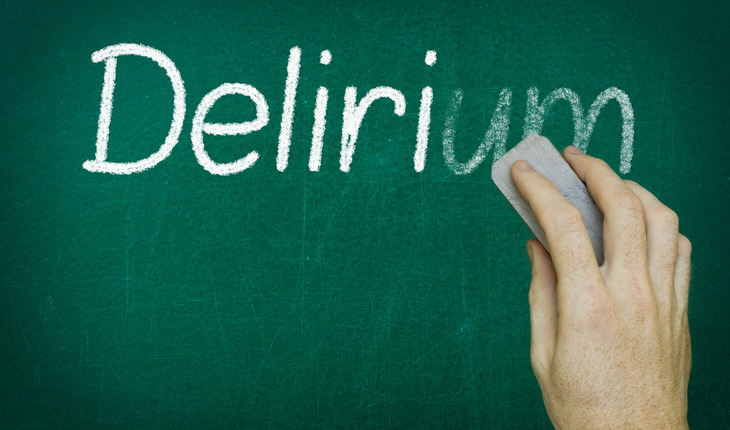 Delirium can also occur in younger patients, particularly those treated in ICUs. Until now, it has not been known how dexmedetomidine, a drug that is normally used to sedate patients, could possibly reduce delirium after surgery. To function normally, the brain relies on a delicate balance between chemicals that excite nerve cells and chemicals that inhibit nerve cells. γ-aminobutyric acid (GABA), the major inhibitory chemical in the brain, plays a crucial role in limiting brain excitability. GABAA receptors, which are expressed on the surface of cells, are the major sensors for the inhibitory chemical GABA. Nearly all general anesthetic drugs target GABAA receptors and markedly increase their function. An increase in GABAA receptor function greatly reduces nerve cell excitability and leads to sedation and loss of consciousness. “We knew anesthetics target these receptors to cause the profound depression of brain function required for patients to tolerate surgery. However, what we found surprising in our previous research was once the anesthetics were eliminated from the body, there was a subtle but continued increase in the activity of GABAA receptors in areas of the brain involved in memory and problem-solving,” Dr. Orser said. In the study, researchers examined if dexmedetomidine reduced the persistent overactivity of GABAA receptors caused by anesthetics and whether it returned activity levels of GABAA receptors back to normal following general anesthesia. They studied GABAA receptor function on brain cells of healthy, young male mice. One group of mice received only the anesthetic drug etomidate, while the other group received both the etomidate and dexmedetomidine. They studied the animals’ memory and problem-solving behaviors days after the drugs had been eliminated. They found that mice anesthetized with etomidate alone showed subtle impairment in memory and problem solving, and an increase in the number of GABAA receptors expressed on the surface of brain cells. In mice anesthetized with etomidate and given dexmedetomidine, there was a reduction in GABAA receptor overactivity, and no cognitive deficits were observed. There are several reasons why it is important to understand how dexmedetomidine reduces postoperative delirium, Dr. Orser said. First, use of the drug is limited, in part because of its high cost. “Understanding how the drug reduces post-anesthetic cognitive deficits clearly strengthens the rationale for using dexmedetomidine to prevent postoperative delirium,” she said. Second, dexmedetomidine can have adverse effects including changes in blood pressure and heart rate. “If we understand how the drug works to reduce postoperative delirium, it will help us to develop new potential therapies that work in a similar way, but with fewer side effects,” Dr. Orser said. The implications of these results extend beyond the perioperative space, given that increased GABAA receptor function has been associated with several neurologic disorders including stroke, Alzheimer’s disease, depression, and inflammation-induced brain injury. Dexmedetomidine, and related drugs that target a similar signaling pathway, may help to prevent and treat these disorders, the authors note. In 2016, ASA launched the Perioperative Brain Health Initiative which has engaged a multidisciplinary group to work with health care providers, payers and the public to create better access to care that minimizes the impact of pre-existing medical conditions that may impair intellectual abilities, and optimizes the cognitive recovery and perioperative experience for adults 65 and older undergoing surgery. Visit asahq.org/BrainHealthInitiative to learn more.